a) First, any transit vehicle that has high infrastructure cost relative to operations can transport bicycles very well – you just have to require that bicycles are transported outside of rush hour, when the train capacity is needed. At other times, it is easy and relatively cheap to provide surplus capacity providing the extra space. That is how Montreal does it. In Germany, bicycles are brought on the transit vehicle, but there are extra tickets that people have to get, that are around a third to half of an adult fare. Note that cost does not necessarily raise linearly with used space. b) Buses are close to never full. The average occupancy of buses in North America is low. If everybody only used buses to transport themselves, cities would probably feel very deserted. Note also that the average occupancy of cars is like 1.3 ppl/car, and cars include big cars. If you put 4 people in every car, you just cut congestion by a third. If you put 10 people in a minibus taking the space of two cars, or 6 people in a big van, you cut space utilization by 75%. So I wouldn’t say that small-group based demand responsive transit is a geometrical impossibility in a dense urban environment, if it’s not geometrically impossible to have 50% of the population drive at 1.3 ppl/car occupancy. Your last point about bikes taking more room while traveling would apply to the cars too, and in a much more drastic sense. So the image is completely fair. Jarrett: Bike racks on buses (and most other transit) can never be more than a niche market. Coincidentally, in the city of the photos (Canberra, Australia) I recently attended a pre-election ‘meet the candidates’ function organised by a bicycle group. All candidates apparently regarded bikes on buses as a motherhood issue. The present minister sounded apologetic because only three quarters of buses are fitted at present. I agree that in a mass transit setting bike cages at stops are the way to go. Do the sums: apart from the onboard space, think of the minute or two extra dwell time to hook and unhook a bike delaying 50 other people already on board. – not many other riders are being delayed. A possible compromise to enlarge the mobility of a certain minority without too much delay would be bikes on trunk routes, on selected trips (meaning of course that the fitted buses would have to be scheduled reliability and advertised). Having lived in a city that has bike racks on all buses, I think the dwell time complaint is overstated. The bike racks are very simple and take less than 30 seconds, and are particularly quick for someone comfortable with using them. Putting your bike on or taking off poses no timing issue if there are others boarding at busy stops. You just join the queue at the tail end. I think Jarrett is right, it is not a real solution, as only a fraction of bus users will ever be able to use racks. But it is a relatively inexpensive amenity that does get used. What it does need, however, is reliability. You need to be confident that the next bus will have one (whether or not it has a free spot), and for that reason, I think cities that add racks should have a policy of adding it to all buses, not just a few. Focusing on main routes first can be a sound strategy if installation is phased, but limits usefulness long term. Where I live, we have a lot of express bus routes that travel on freeways with long distances between stops. At the suburbia stops, the quality of connecting buses is often sub-par and some areas has no connections whatsoever on Sundays. This is fine for people who live in the suburbs and drive their car to the bus stop to visit the city, but for people who live in the city that are visiting the suburbs, carrying a bike on board the bus is really the only way to make the system usable, short of calling a friend or the local taxi company and asking them to pick you up at the park and ride. I believe the solution here is to carry a human-powered vehicle on board the bus, but something that is small enough to be brought on board, like a folding bike, skateboard, or kick scooter. Didn’t you already make at least one of these points? There are plenty of urban settings where the headways of 40′ buses are an awful lot less than once per minute; a substantial fraction of MBTA bus routes in the greater Boston, MA, USA area have headways less frequent than every 5 minutes even at peak times, and in such places, replacing the 40′ buses with lower density, more frequent service ought to be a win. The flip side to the second point is that the difference in space requirements is much more substantial if you assume that the vehicles are actually moving. (And this applies not just to the cars, but for the bikes as well, which are bunched together like they’re competing in the Tour de France.) Not to mention the additional time to get 40 cars through an intersection vs. one bus. If you are trying to make the point the cyclists would take up far more space than the illustration depicts based on the number in the group you are missing the point of the picture. Certainly it would be very rare if ever during a normal day when people are cycling as transportation that you would have such a large group of cyclists congregated at any point on a roadway at one time. OK, I’d like to debunk a myth that keeps cropping up here and elsewhere about bike racks on local buses: their value lies less in being part of a multi-modal trip and more in being there ‘just in case’. A helpful analogy might be the taxi system; when you don’t have a car or your car is out of commission or you need to make an important one-way trip, you call a cab. Critiquing the use of taxi-cabs because there aren’t enough for everyone (or as in the picture, enough for the peak transit demand on a route) is similarly silly. I cycle everywhere, and only use the bike racks occasionally, like when I get a flat tire and don’t have time to fix it, or when a more serious mechanical issue crops up. Bike racks on buses extend your freedom: you can bike with fewer tools, without rain gear, or even without a lock if you can take your bike inside your destination. If something untoward happens you put your bike on the front of the bus and finish your trip. This happens to me once every couple of months. At the core of the misunderstanding is that for local bus trips, a cycling trip is about as fast, especially if you compare the two modes in door-to-door time and not just average speed in traffic. People won’t choose to use the bike racks because they can just bike to their destination and save a transit fare. But I wouldn’t call them a “niche market”: I think they’re essential like good bike parking and bike lanes. Note that this argument is even more important for people who point at the empty bike racks and say “look, what a waste!” What they don’t realize is that the mere presence of bike racks encourages cycling. Buses are close to never full. Certainly, I can’t think of any bus line where the average utilization is 100%, other than perhaps a few peak-only routes. Bus lines that run late at night will have empty seats. And yes, many “coverage” routes through car-centric suburbs are largely empty during peak hours. But there are many, many, many, many many examples of bus lines ’round the world that are SRO during peak hours, which regularly skip waiting passengers because there is nor more room. And in many cases, the headways are so low that adding more busses won’t solve the problem without major infrastructure improvements. And for planning purposes, it’s peak hour that needs to be designed for and accommodated. Fitting people and stuff on an empty bus is, in general, not a problem. I’d like to second Bradley Wentworth’s remarks. I’ve made many, many bike trips where I knew I had the potential to use the bus if the weather turned horrid or if I ran out of steam, etc. But I’ve only ever actually put my bike on the bus once when I had a flat. Bike racks on buses are an important way to facilitate cycling. They’re less about actual transit use and more about encouraging alternate modes of travel. This sort of thing is very difficult to quantify, but there’s absolutely no doubt in my mind that it’s a very real effect. Also, I hope I’m accurately imagining that you were wryly quirking your lips while writing the line about the absolute infallibility of human-designed software. However one point about the image at the top of the article – like a lot of the bike lobby “information” peddled around, there is a fundamental dishonesty in the presentation. As pointed out by an earlier poster, those bikes are bunched so close together they couldn’t actually move. If they were spaced out in a realistic way, I suspect they would take up nearly as much space as the cars. Not everyone has typical transit needs — wheelchairs on buses are also a niche market, in a sense , but vital to those people. Wheelchair users are incapable of getting around any other way, and we view getting around as a basic human right. In contrast, if there is no bicycle infrastructure, bicycle users can always get around the same way as everyone else. If they were spaced out in a realistic way, I suspect they would take up nearly as much space as the cars. If the cars were spaced out in a realistic way, they would take up much more room also. Anyway, bicycles are preferable to cars in terms of collision danger, pollution, public health, noise, and so on. For those reasons I’d rather have bicycles than cars on my street, even if they took up the same space. Where I come from we used to hang prams (baby carriages) on the back of buses – in fact the driver got out and helped women hook them on. Which REALLY slows the route down, and possibly costs the transit agency more money than the pram’s space on the bus is worth. In my city (currently), parents with prams get on the back door so there is no delay whatsoever. They then come to the front to pay. You are totally missing the point, even though you then go on to support it, which is simply that accommodating bicycles, wheelchairs or prams allows greater transportation options and increases the likelihood someone will want to and can use the bus. Bike racks are a niche market, but do allow a certain amount of service extension at very low cost. I know a couple of people who use racks-on-buses frequently, as there is no bus service to their place of employment. While there is bus service to their homes, having access to a bike at both ends of the trip shortens the total trip time by about 15 minutes. So for locations where it’s uneconomical to provide bus service (or at least frequent bus service), the small number of people able to make that additional connection using a bike is a great option, and racks are much cheaper than setting up a Velib/Bixi/Borris Bike type system for a small number of users. It is a niche market, though. I absolutely love one thing in the new picture: the position and angle of camera is absolutely the same for all three photos. That wasn’t the case in the old photo. I believe there is definite value in bike racks on any bus route that travels at a speed faster than biking speed, so faster than say 18kph point-to-point distance. In practice, this limits to the usefulness of bike racks to suburban routes and possibly urban express buses running on major freeways or arterials. 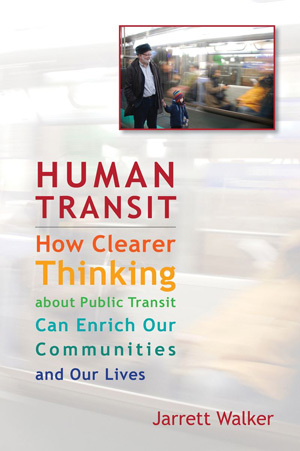 However, I believe that they form an integral part of a complete transit solution. By combining bike and bus in a suburban context, the travel time savings can be immense and time-competitiveness with respect to driving can increase to the point that (given the cost savings), public transit can actually become a logical choice even for “choice riders” on routes where that otherwise would be impossible. Issues like long walks to/from stops because of low density: GONE. Issues caused by poor connection times: MOSTLY GONE (by biking one of the legs instead of using the bus). Now, while it’s clear that there is a capacity limitation there, in practice, in 3 years, I’ve been rejected from a bus once due to the racks already being in use. I find that automatically (culture, call it what you want), only maybe 20% of people will even consider the bike-bus combo, and that’s only if it suits the trip being taken, so overuse really isn’t an issue, at least not at my agency CIT Laurentides in the northern suburbs of Montreal. So far, no urban buses and few suburban buses in Montreal offer this service, but in the US this service seems to be the norm among many urban agencies. Are you really telling me that these racks are used enough to warrant the levy of an extra fare or to cause major inconveniences to users? I somehow doubt that is the case! The Boston Harbor crossings in Massachusetts, USA, are in interesting case, in that the Ted Williams Tunnel and Callahan and Sumner Tunnels permit automobile traffic but not pedestrians or bikes. (The Ted Williams tunnel does carry the SL1 bus.) I believe the Tobin Bridge also prohibits pedestrian and bicycle traffic, while carrying at least one bus route. And the Blue Line subway tunnel is not far from the Callanhan and Sumner Tunnels. Fred, the cars aren’t exactly spread out either. They’re parked pretty compactly. Transit serves many niche markets. And given the network effects of transportation infrastructure, service to many niche markets is how one builds a transportation system. After all, in a network with dozens of line, the riders whose homes/destinations lie along a particular bus line, could be considered a “niche market” by virtue of that fact. Chances are, service to each of these niche markets costs the agency money. But the total of all of these niche markets, is way bigger than the sum of all the parts. Bike share. Having bikes available at major transit stops is the best way to integrate bikes and transit for last-mile mobility. Of course, it all depends on context. In dense areas, the bus is more of a circulator and if you have a bicycle with you, it will almost always be faster and easier to just pedal to your destination. If you have a multi-centric region, you can have bike share stations available, as I said, at major hubs and stations. On the other hand, if you have a completely decentralized metro, then many people would need their own bike at both ends of their trip and boardings will be spread out along bus routes, so there are no really efficient solutions. Bike racks on buses are nice to have when they’re not used much, but they easily become victims of their own success. In a place with lots of people biking, the racks will quickly become overwhelmed. This leads to excess delays as more people are stalling the bus taking their bike on and off, and by making people who want to take their bike on the bus wait for the next one (or the one after that, or the one after that) with an empty space on the rack. This is why you don’t see bike racks on buses in many European countries, especially the ones with strong bike mode shares. What’s the alternative? Space for bikes inside the vehicle is one. That may mean longer vehicles, but when you have a more hierarchical transit network that adds streetcars, light rail, commuter rail, subways, etc., then they can devote a large portion of one of the cars to holding bikes, which is easier than on a bus. For things like day-to-day commuting, they just leave their bike at the station which has protected racks or bike lockers. For someone who needs a bike on both ends of the transit ride, they have two bikes that they leave at each end so they don’t have to worry about cramming it onto the transit vehicle somehow. When in Heidelberg, Germany the tram tracks in one street were renewed, a local citizens association for this district used the opportunity to demonstrate how much space cars would need if they would replace the tram. They took a tram with 40 meters length and space for 230 passengers. For the photo they estimated 50% of the space would be taken (115 passengers). If they would travel by car 100 cars would be needed. Well, to a degree but not as much as you might think, at least in my experiences as an electric-bicycle commuter in China. (Of course, the same goes for buses and trains; far more people can get on Russian, Japanese or Chinese mass transit than ‘Merican or Canadian because they will actually move together and even – shocking! – touch each other.) 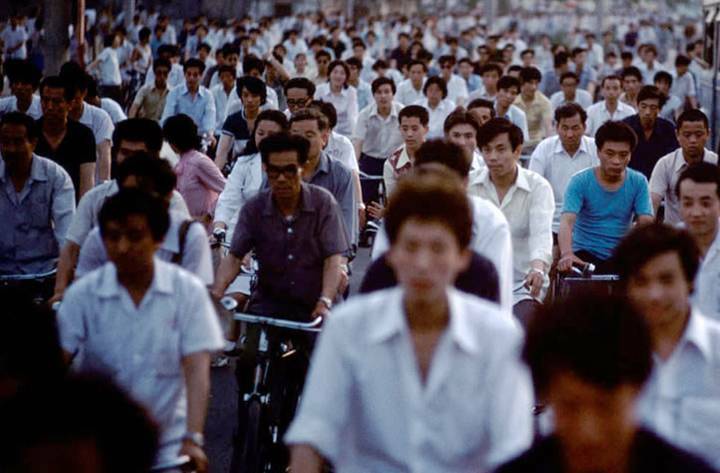 In a true bicycling crowd, just like in heavy driving traffic, most people – with exceptions – tend to move along together at a reasonable speed instead of riding like individualistic maniacs. After experiencing bike racks in San Francisco, they are invaluable for odd trips. They make living the car free dream that much more possible. We even used a rack to go on holidays, which was cycling 2 days back to the city. Putting a charge on carrying a bike on transit will discourage cycling. All you need do is ban them on certain peak services, like they do on BART. It is frustrating that you note bikes take up much more space. The space between handlebars is very achievable in my opinion. If you only go 2 abreast x 30 long, it will approximate 4 bikes x 15, a longer narrower rectangle of similar area. Further, they will be much more compact lengthwise than cars, given their peak speed will be less (mind you their average speed is similar to cars in the inner city). At intersections cars can never match bikes for smooth flow. Finally there is parking space. In the United States, engineers from UC Berkeley estimate there are “only” about 3 or 4 parking spaces per automobile. That’s 800 million spaces, or about half the size of Massachusetts. And that’s not including the interstates, local roads etc etc just sitting there to service the cars. The photo underestimates the space taken by bikes compared with cars?? Come on Jarrett. This is the first time I’ve read in your blog and scratched my head. So if we were to use one measurement that describes the situation best, it wouldn’t be “space taken up by 40 cars; buses or bicycles” because they all take up a different amount of space when moving at different speeds and the slow ones must stay on the road for longer. It would be flow rate controlled for lane width: persons per lane per hour. Flow rates don’t allow for the space vehicles take up when stationary. In this sense I do not think the spacing of the cars and bicycles in the photograph is misleading: in the context of a discussion of congestion, it shows the amount of space queued traffic (on cars or buses or bikes) will take. However, it is misleading in a broader sense, in that despite Jarrett’s claim that urban space is the ultimate currency, it is not quite the zero sum game that metaphor implies. In the road illustrated a flow of bicycles can easily share a lane with a flow of cars, so if trying to calculate a flow rate, how many lanes should be attributed to bicycles? Because people on bicycles and on foot are able to use urban space much more efficiently and flexibly than people in vehicles, they can effectively create extra space in cities. As at least one other touched on, this is nothing compared to what it would look like if you include parking (at both ends of the trip)! I’ll also agree with others that bike racks on buses serve as a good emergency tool or for extra long trips. But they work well only in the context of good general bike infrastructure. I know some people who use them for trips they would do on a bike if distance was the only issue. But for them it is more that they need to go through routes that are perceived as too dangerous to bike. Obviously, this won’t scale well. Bikes on rail works significantly better because adding more space a lot more feasible. The most disruptive issue there seems to be more about station entrance and access. As with any similar comparisons, the photo op is naive in its purposes to “demonstrate” anything as people on any ROW, regardless of mode, very rarely are travelling all from one place to another (say, within a 300-yard maximum radius). Fitting more people in less space is pointless if this “efficiency” gain is negated by so-called last-mile and frequency issues, often discussed here. Now, in relate to bicycles on transit vehicles, I second those saying that bike racks, or bikes on trains/trams, are only viable as far as biking remains a niche for spandex or “feel-good” riders. Let’s take a look on metro areas where bicycles have really widespread use like Rotterdam (Netherlands) – bikes are banned from subways, trams and most buses 24/7 with a few exceptions of especially fit buses. Restrictions apply to folded bikes as well. This is the standard practice for other big Dutch cities. You can take your bike on commuter trains, subject to space availability and a non-trivial surcharge. What people do? They park bikes on or near bus stops, train stations and the likes. Many have enclosed lockers for rent on long-term subscription plans. So the only reasons bike racks mounted on buses “flourish” in US is because there are few people using bikes first place. What Andre said. And on top of that, the more people use bikes, the more impetus there is to provide protected bike parking at the stations. Doesnt change the point, but bus racks for three bikes are common. I believe racks for four exist, havent seen one myself though. I was there when the photo was take and highly support the community effort in getting the alternative transport options out there. Space use is one aspect the picture is making. It is more to make a person realise there are other ways of getting around and you are not limited to one form of transport or even one transport mode for the entire trip. I use the bus and often take my bike on the bike rack. 3km ride to bus stop and bus trip to work and 20km ride home. both trips take about the same time. Yes it is a neich market but the more demand the core bus routes have the more it will be upgraded to LRT/BRT with in Cabin hooks on the ceiling. Individual travel options to mix modes can occur. Multimodal travel and different options for travel is the goal. I’d like to second Bradley Wentworth’s remarks. I’ve made many, many bike trips where I knew I had the potential to use the bus if the weather turned horrid or if I ran out of steam, etc. The bikes in the photo appear to take up much *more* space than they really do. How much? You might guess they go about halfway towards the road barriers. Look closely – the end of the bikes come in line with the 3rd car. The total length is 15 cars. The bikes take up 5% (3/60) of the space of cars. Lets be generous and say that bikes are taking up 1/10th of the space. Yes the photo is misleading. Bikes are actually much better than you’d think. Now picture them in front of your house or your child’s school. Which picture is preferable then? The second set is likely to be quieter, cleaner, and safer. But hey – lets just talk about space. This is the point I was trying to make earlier. Bike racks, even though they’re not often in actual use, increase cycling mode share far beyond their own actual capacity and therefore reduce vehicle and transit ridership. That’s a very desirable (albeit quite difficult to measure) outcome. At speed, the cars would require even more space to operate safely than would the cars. I ride my bike frequently and rarely need to use the bike rack on the bus. I used to alternate riding a bus with biking to the train when I lived in a suburb with good train service. Every time I took the bus I saw the same guy put his bike on the bus rack. He got quick at it so I don’t think that the time spent loading a bike is a problem. Not everyone is going to be a biker and I think 2 racks is sufficient for the way people use bikes and buses today. I think the biggest thing holding people back from wider bike usage (besides lack of great bike lanes) is the lack of facilities at destinations like locker rooms. I think your argument for a bike share program is pretty good. It is annoying to have to wait 10 mins to transfer to go that last mile. It’s almost a break even with walking at that point and a bike sharing program could be a great way to speed that last mile up as well as save room on transit vehicles for people that are making longer trips. 2) There are three basic uses of space at play in traffic: continuous flow; being stopped at/accelerating out of a red light; and while parked. Bikes stack at something like the pictured density in the second and third scenarios, though not in the first. 3) When it comes to signalized urban grid areas, most of the congestion comes not from the lane capacity in continuous flow but in the capacity of each traffic signal phase, which is in turn dependent on intersection density. So of the three scenarios in point (2) the second one is arguably the single most relevant to congestion conversations. The photographs are attractive but they need scientific road-testing. London has many bus-lanes with good enforcement by a system of cameras and fines. Oxford Street traffic is bus and taxi only and has 160 buses/hour in each direction. The average occupancy is only 18 passengers and the buses only travel at walking speed. Mostly, the buses are bunched and there are long stretches of empty road between the bunches. On the main roads into London there is less bunching and there are far longer gaps, of empty road, between the buses. So my guess is that a ‘crocodile’ flow of bicycles, of the kind you see in Copenhagen and Amsterdam, would transport far more passengers in the same road space (and with less noise, pollution, cost, obesity etc). Does anyone know if passenger flow in dedicated bus and cycle lanes has been empirically tested? I’ve never seen bike racks on buses here in Europe and you generally can transport bicycles only on traditional trains, but not during rush hour on the S-trains. I guess that they’re a nice to have, but not worth the investment to systematically introduce them in new places imho, considering increased dwell times and that they’re destined to be victims of their own success if used to promote last mile bicycle mobility. In areas where people ride bicycles for leisure where there are no trains and just one main bus line, like certain valleys, they could be useful though, as non-lycra tourists get tired. By the way, are the suburbs and cities so crime-filled that you can’t leave your bike parked, properly locked, at a classic bike rack or locked to a fence or anything? I’m currently in a big city known for bike theft, microcriminality and lack of control of who’s who and yet I see a bunch of carelessly locked bicycles every day, so bike theft probably isn’t as big a problem as it sounds it is. 1. bike share stations close to stops or important places in the dense areas of sufficiently big cities. I’ve seen it work, people really do use it. 2. rental bicycle lockers or bigger bike stations at the main stops everywhere else, so that people can leave the bike overnight on the other end of their commute. Why not make a car very expensive license? Hong Kong is the way to copy. 20K annual fee for licence plate.